This website requires IE9 or higher. This website page is optimized for desktop viewing. Please open your browser to a wider size. Up until now, women's fastpitch softball pants have been designed through reverse engineering: Take a man's pant. Make it smaller. Make it pink. Traditionally made entirely of polyester, they provided no stretch, no support, and no movement in areas that are supposed to move. Introducing the 3N2 NuFIT KNICKER - an innovative, fit-meets-function fastpitch softball pant designed with the female form in mind, and patented for its unique design and utility. Flattering design lines create a sleek, slimming effect. Low-rise fit in front for comfort and high rise in back for coverage. Poly-spandex cuff doesn’t rub or cut. Reinforced with double-ply poly knit to protect high abrasion areas. 4-Way stretch poly-spandex in hips, thighs, calves. Hugs curves and allows for easy movement. 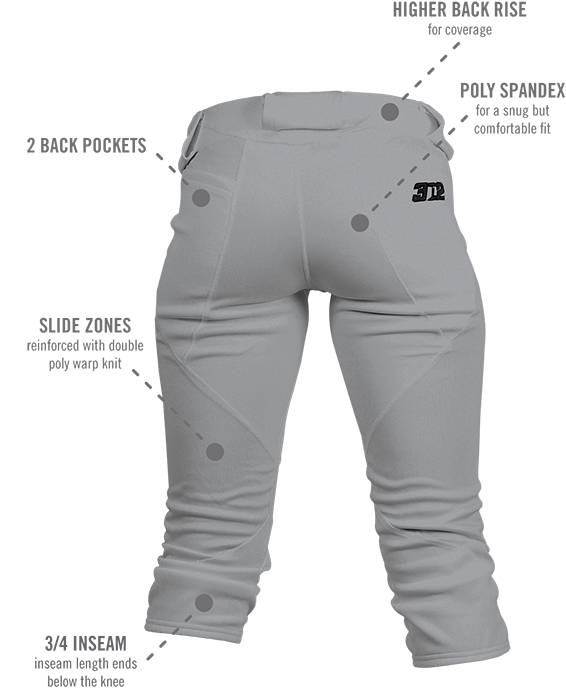 Fastpitch athletes no longer have to roll their waistbands or worry about pulling up the back of their pants. Coaches have the benefit of a pant that looks great on all their players. The fit and fabric of NuFIT Knicker fastpitch softball pants provide a flattering look for the wide-range of body types playing fastpitch softball. Inspired by women's lifestyle apparel, the fit features a unique yoke with a lower front rise for comfort, while offering full coverage for the back side. 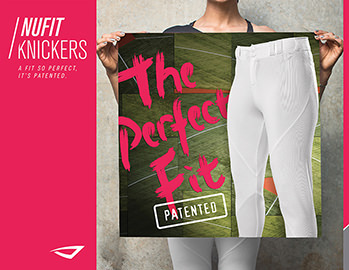 The NuFIT Knicker is the first fastpitch softball pant to address the realities of athletic function and female form. No other pant on the market provides durability in the actual high abrasion areas that fastpitch softball athletes put to the test game in and game out on the diamond. 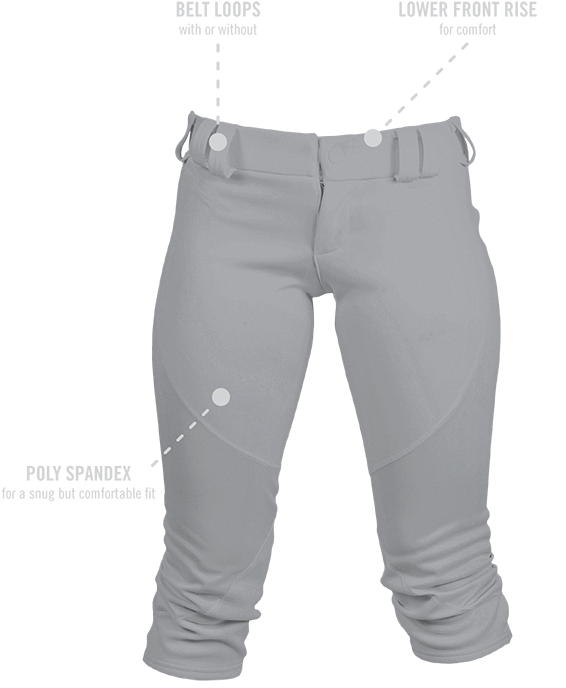 Other pants assume that softball players slide on their knees, while fastpitch athletes are actually coached to slide on the sides of their upper leg and inner knee, which is where NuFIT Knicker fastpitch softball pants provide extra coverage. Are you a fastpitch softball dealer, coach, or organization? Contact a 3N2 Sales Representative today for more details on pricing and customization options for NuFIT Knicker fastpitch softball pants. Ready to buy a pair today? Head over to 3N2Sports.com to shop your options. © 3N2 LLC. All Rights Reserved.